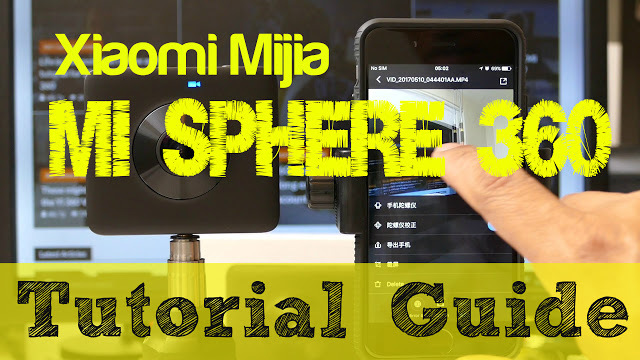 Here is a detailed tutorial for Xiaomi Mijia Mi Sphere 3.5K 360 panoramic camera. This tutorial has been updated for Mi Sphere iOS app 1.6.4 and Mi Sphere Android 1.6.4.12888 and above. Hi Mic, I need your help, yesterday arrived my Camera and I prove it and everything worked fine, but today I actualized the firmware and the app in my smartphone (nexus 6p) dont sincronized with the camera, after a moment the camera doesn’t want to turn on, the blue lights blink, I don’t know how to reboot the camera, I don’t understand Chinese. I want to know what Xiaomi Recommendation software in order to view or editing the still 360 photos or videos from Desktop (windows 10)? Hi Paul there are many software for editing 360 photos and videos. For a simple video editor, try Collect (Android) or V360 (iOS or Android). For photos, try the Theta+ app (iOS or Android). For Windows, 360 video editors include CyberLink ActionDirector 2, Cyberlink Powerdirector, Magix Movie Edit Pro Plus 2017, Pinnacle Studio Ultimate 20.5, Magix Video Pro X, Adobe Premiere Pro.